So it has finally happened for really realz. As I’ve blogged several times already, I have finally been able to get a short story published. Titled Dharmasankat: Crisis of Faith, this short story is an Indian Urban Fantasy sometime in the 1800s and acts as an origin prequel to my novella Dharmayoddha: Warrior of Faith, for which I’m still hunting for a publisher, without luck. There will be a follow-up novel Dharmachakra: Circle of Faith at some time in the future once I’m done with my current novel WIP Cloak of Secrecy. Manifesto: UF is now available through Amazon as a digital book. You can purchase it here. I haven’t yet had a chance to read the anthology myself, but I will be correcting that first thing next month, and I’m really looking forward to it. I’ve read full novels by several of these authors already and I’ve been fairly impressed with their work. And all props to editors Tim Marquitz and Tyson J. Mauermann for putting this anthology together and taking a chance on an unpublished writer like myself. I hope that you, the readers, will look favourably on the short story. And even if not, thanks for reading all the same. That’s the least I could ask for. 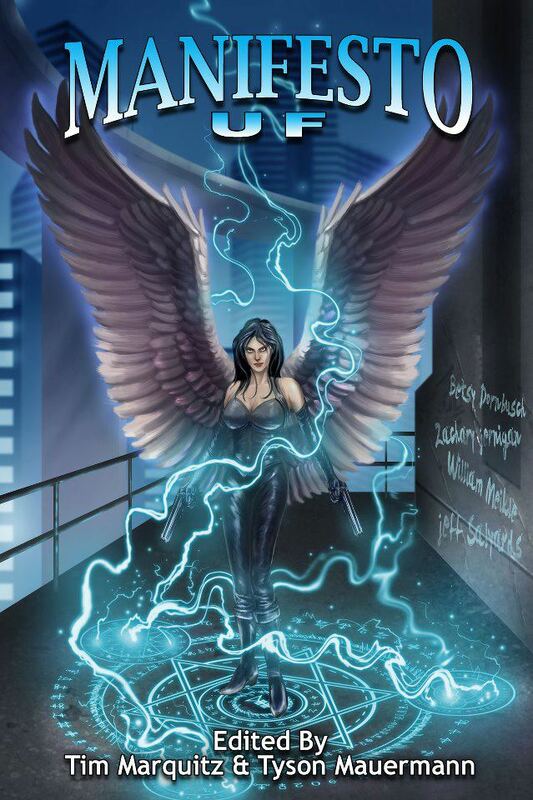 Back in May I announced that my short story Dharmasankat: Crisis of Faith had been accepted for inclusion in Tim Marquitz and Tyson J. Mauermann’s urban fantasy anthology Manifesto: UF. You can read that post here. Since then, I’ve been keenly anticipating the release of the anthology and seeing my name in print for the first time. I won’t lie, I’m superterriblyamazingly excited for this. After several false starts and abandoned projects things are beginning to work out and it looks like I do have the start of something great here. Just a couple days ago, I looked at the final edited version of the short story. There actually weren’t any serious edits there other the American English-ization of a few terms here and there, and that too because I tend to write in British English, owing to my aspirations to one day write for Black Library’s Warhammer Fantasy and/or Warhammer 40,000 settings. Having that be the most serious editing required makes me really glad. Glad that I didn’t screw up anything with my debut effort. The anticipation of release is eating at me right now, as is the fact that Dharmayoddha: Warrior of Faith is still on submission and I haven’t heard anything about it yet. Either way, I’m really looking forward to the release of the anthology. In the meantime, since it was finalised, here’s the Table of Contents for the anthology. As I mentioned in the other post, some of these authors are friends I’ve made in the last few months ever since I started reviewing and to be able to share the same writing space as them is thrilling. Too, fellow reviewer Nickolas Sharps is making his own debut here as well and both of us are right smack in the middle of the TOC. The anthology will be released in less than a month’s time, on 1st September, through Angelic Knight Press. I don’t have any of the usual bells-and-whistles links for you yet (Amazon, publisher product page, etc), but I do have the Goodreads page. I’ll get the other links as soon as I can. In the meantime, if you could head over to Goodreads and add the book to your reading shelves, that’d be great. Thanks to everybody who’s helped so far. Much appreciated! The Big News – It Has Begun! Folks might remember that I made a note of my intention back in January to submit a short story to Manifesto UF, a short story anthology being edited by author and editor Tim Marquitz, as well as Tyson J. Mauermann, for publication in September. My intended idea for this was to write something with Vikram Chauhan, the protagonist of my urban fantasy novella Dharmayoddha: Warrior of Faith, set in the present day in Mumbai, India. However, before I got to writing the short story , I meant to do two editing passes on the novella so I could properly frame the setting of the short story and have a better idea of what Vikram’s character was like. Thing is, things didn’t turn out exactly to plan, as I mentioned in this post. My fear was that I had started out too late and that I would not be able to get it done on time. Sometimes, all you need to have is a little faith (pun intended)! And I suppose that I had plenty of it because the DAY AFTER I submitted the short story, I had a really awesome email waiting in the inbox.